Fusion is a popular term in the culinary world, and generally denotes the blending of two different styles of cuisine to recreate an established dish, or create an entirely new one. We can find this in the beer world as well, as yeasts have begun to travel continents, ingredients are from halfway across the world, and the brewing world gets smaller and smaller (while getting larger and larger) due online resources and a burgeoning community. 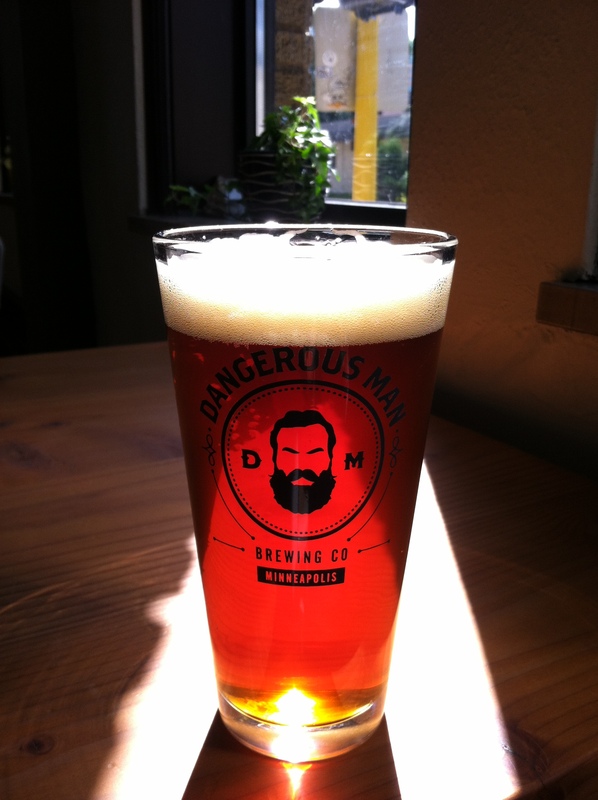 Dangerous Man raises its glass to innovation and is proud to present the German IPA. The concept behind this beer was to use all German ingredients — malt, hops, and yeast — and brew and ferment the beer in an American West Coast IPA fashion. The base malts of this beer are Vienna and Weyermann Pale, both of which give a pleasant biscuity flavor, low protein content, and a sturdy base for the supplementary malts to play in. Munich, Carafoam, Caramunich II, and Melanoidin, are all included in the grist bill, and help reinforce the strong German malt presence in this beer. Hints of biscuit, toffee, caramel, and that distinctive Munich malt taste (which will help to usher in the flavors of fall) can be found hiding behind the impressive, dare we say it?, egregious, hop bill. The German IPA is measured to a hefty 82 IBU’s, so for those who love their bitter, and those who love their hops, this will be the beer for you. German Magnum, Opal, and Polaris hops were used at different times in the boil, and then Magnum and Opal were used to dry hop this beer twice over. Yessir. Twice over. It doesn’t get much more West Coast IPA style than that, well, I suppose… if we put a bird on it we might be able to call it a little slice of Portland. Here’s to hoping. Keigan is particularly proud of the use of the German Polaris hops, one of the most resinous, hop oily hops on the market, and is one of the highest Alpha Acids available, generally ringing in at 21%. This resin bomb was added at 20 minutes and 15 minutes left in the boil and should provide a very tropical and citrusy flavor to this beer. Imagine Keigan, eyes half closed, pouring this resin bomb into the boil kettle, muttering, “daaaaankk…” at 7 in the morning; it was pretty dope. This hop is a monster, more monstrous than Nicki Minaj, more monstrous than Billy Crystal, more monstrous than if all the wrestling federation melted into each other and decided to open puppy mill for teaching dogs how to professionally wrestle. Get it!? Monster! Well. That’s what we gots. Not even Indiana Jones could have defeated this German, though, who knows, he had a way about him that rocked the world down to its archaeological roots. Drink hearty, drink smart, drink local, and for chris’ sake, drink Dangerous! Various different malt tones strike though as the beer warms, including biscuit, toffee, and caramel as well as the distinctive toastiness of the Vienna malt. The hop bill is resinous and huge, offering citrus, pine, and hints of menthol that give an special sharpness to this beer. The German yeast provides a clean, light-in-esters backdrop for this wonderful beer to explore.